We’d love your help. 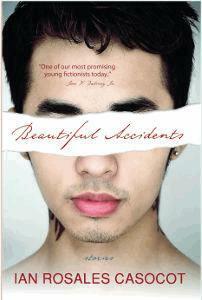 Let us know what’s wrong with this preview of Beautiful Accidents by Ian Rosales Casocot. To ask other readers questions about Beautiful Accidents, please sign up. Ian Rosales Casocot was a fellow for fiction in the national writers’ workshops in Dumaguete, Baguio, Cebu, and Iligan, and was a writer-in-residence for the International Writing Program in the University of Iowa. He has won the Don Carlos Palanca Award, the NVM Gonzalez Prize, and the Fully-Booked/Neil Gaiman Philippine Graphic/Fiction Award for his fiction. His books include FutureShock Prose: Ian Rosales Casocot was a fellow for fiction in the national writers’ workshops in Dumaguete, Baguio, Cebu, and Iligan, and was a writer-in-residence for the International Writing Program in the University of Iowa. He has won the Don Carlos Palanca Award, the NVM Gonzalez Prize, and the Fully-Booked/Neil Gaiman Philippine Graphic/Fiction Award for his fiction. His books include FutureShock Prose: An Anthology of Young Writers and New Literatures, which was nominated as Best Anthology in the National Book Awards given by the Manila Critics Circle; Old Movies and Other Stories; and Heartbreak & Magic: Stories of Fantasy and Horror. His novel Sugar Land was long-listed in the 2008 Man Asian Literary Prize. He lives in Dumaguete City.